When updating your roof, looks are always important, but so are installation needs, material costs and weight. The good news is that a wide selection of roofing materials is available, including composite shingles, asphalt, slate, and clay tiles and concrete. Roof types consist of the material and shape that is used in the construction. There are many to choose from, and each will vary in terms of durability, appearance and cost. Slate roofs are considered by many to be the most durable money can buy. The material is extracted from quarries and when properly cared for can last a century. The most popular shapes used in roof construction are mansard, flat, hipped and gambrel. The shape of the roof will play a key role in establishing your home’s architectural style. Drive through any area of New York and you will see homes that have all sorts of roof types. Some roofs will be a gable, while others will have a mansard or hip shape. It isn’t unusual for properties in the New York area to incorporate multiple shapes within a single roof, such a roof that is hipped which also has gable dormers. Roof frames range from basic to complex, and roofing contractors in NYC are experienced in dealing with all of them. Whether you desire a dormer, overhang or hip, we can build it for you. The benefits you’ll gain depend on the roof shape and material you choose. A mansard or gambrel roof provides additional head height within attics, while shed roofs are the simplest to attach to another roof. Asphalt shingle is frequently used as a roofing material, due to its low cost and installation requirements. It is comprised of fiberglass which has been asphalt impregnated and provided with a surface that consists of granules which are similar to sand. 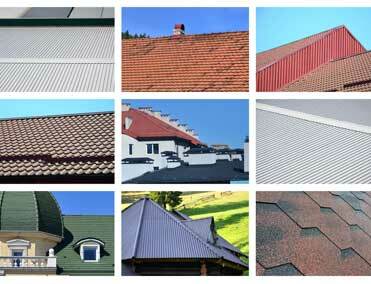 Another popular roofing material is metal, which can come in the form of copper, aluminum or steel. These materials are both durable and costly. Copper and lead will usually be installed in the form of shingles but can also be designed for use in seamed roofs which incorporate vertical length metal which is connected via solder. Finally, those who own Spanish or Mediterranean style homes will opt for cement or tile. Like metal, it is expensive and heavy but is exceptionally durable. When remodeling your roof, its existing structure will often determine what can be used as a roofing material. You will need to speak with your contractor about the texture, color, durability and weight. No matter what option you choose, the roofing project will likely require flashing. Why Choose Us for Roof Installation Services in NYC? A. Stewart Roofing and Waterproofing is an established New York contractor which has been in business for many years. We’re certified and insured, and provide a variety of roofing services to our clients. Whether you need a new roof or simply want to remodel an existing one, we will get the job done right. Contact us today for a free estimate.